PM Narendra Modi lays foundation stone of two metro corridors — Thane-Bhiwandi-Kalyan Metro & Dahisar-Mira-Bhayander Metro and CIDCO housing scheme in Maharashtra. 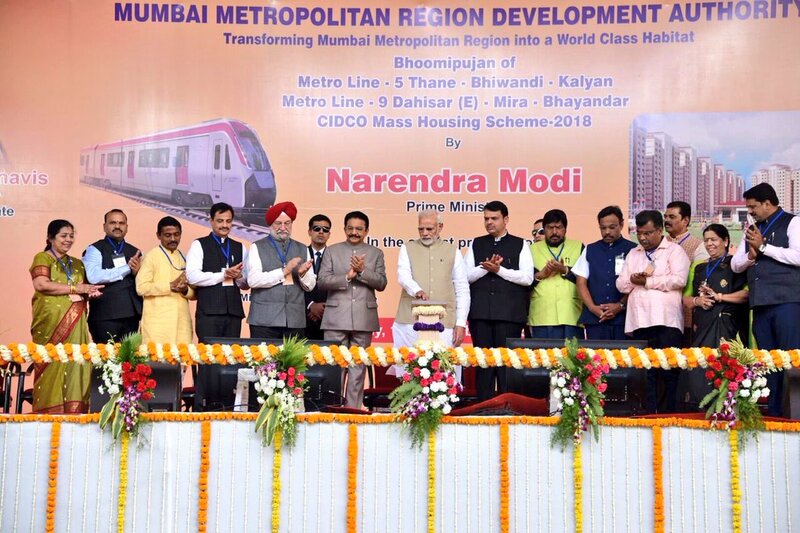 PM Narendra Modi lays foundation stone of two metro corridors — Thane-Bhiwandi-Kalyan Metro&Dahisar-Mira-Bhayander Metro and CIDCO housing scheme in Maharashtra. PRIME MINISTER Narendra Modi will lay the foundation stone for two key Metro rail projects and housing scheme comprising 90,000 units under the Pradhan Mantri Awas Yojana for Economically Weaker Sections (EWS) and Lower Income Groups (LIG) on the outskirts of Mumbai today. which is in full swing. Administration officials have been engaged in cleaning the city for the past one month. Here, the Shiv Sena has announced to boycott the program. Flags and banners are being set up to welcome the Prime Minister. The credit of the Metro project is taking both of the ruling Bharatiya Janata Party and Shiv Sena. The Thane-Bhiwandi-Kalyan stretch (Metro 5), a 24.9-km corridor that will be built at an estimated cost of Rs 8,416 crore. There will be is 17 stations on 24.9 km route. The entire system will be prepared according to the six coaches Metro Rail and expected to carry 2.29 lakh commuters daily when it will be inaugurated in 2021. The Dahisar-Mira-Bhayander line (Metro 9) that will run 10.3km and is to be built at an estimated cost of Rs 6,607 crore. The elevated Metro 9 corridor, comprising eight stations, was expected to be completed by 2022. Launch of Metro project in Pune: Prime Minister Narendra Modi will lay foundation stone of Metro project (between Hinjewadi and Shivajinagar). The length of the metro line between Hinjewadi and Shivajinagar is 23 kilometers and its estimated cost is Rs 8,313 crore. Modi will return to Pune on Tuesday night only. After Modi, BJP President Amit Shah is reaching Mumbai on Wednesday. Minister of Maharashtra Rabindra Chavan said that tomorrow’s program will be very important. Probably Mr. Modi can launch the campaign for this upcoming Lok Sabha election from this forum.. Please install solar panels on the roof of the metro coaches for power generation.